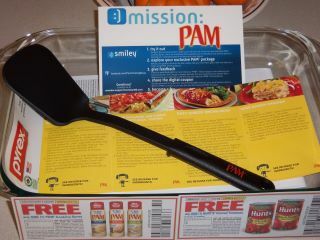 The new and improved PAM® formula has been shown to be 70% better at attacking baked on food vs. bargain cooking sprays. Not only will every meal be picture-perfect, but you’ll have more time to enjoy your food and spend less time soaking, scrubbing and cleaning in the kitchen. Put your toughest recipes to the test and watch as PAM® comes to the rescue! No matter what meal you’re cooking, PAM® helps you pull it off. Even better. Pyrex and Pam work wonderful together!﻿ This mission was the best I have got to try! The Pam was wonderful and my dinners don't stick to the bottom of the Pyrex pan! I have since made enchiladas, lasagna and meat loaf in my Pyrex pan. The spatula allowed everything to come out and serve all the kiddos evenly. Thanks to Pyrex, Smiley360, Pam and hunts for the FREE items to try and review. I love PAM, Its a great alternative to butter! i love cooking spray it makes baking so much easier! that's cool you got that all for free.